As I mentioned in my previous blog post, I’ve realized that I require additional equipment if I’m to take my training to the next level. One of the items I placed on my must-acquire list was a whole whack of pucks for shooting practice. Like any schmoe who plays hockey, I had some pucks kicking around the house, like 10 or so, but I knew this paltry number wouldn’t do if I was going to work seriously at improving my shot. I needed to take a significant number of shots every day but also wanted to minimize the amount of time spent retrieving pucks. The solution, I figured, was to have enough pucks that I could shoot the entire batch once, then retrieve them afterward and be ready for the next day. The number I settled on was 200. This may seem crazy, but it isn’t. I estimate that a hockey player, while practicing his shooting in much the same way as a golfer practices at a driving range, can fire a puck every two to four seconds. So working through 200 pucks would take anywhere from 400 to 800 seconds (seven to 14 minutes) – a manageable amount of time to spend every day. Plus, I think 200 pucks would be manageable space-wise and lead to improvement if shot every day. So I set about finding 200 pucks. About the cheapest place around to buy pucks in my part of the world is Canadian Tire, a department store. It sells brand new pucks for 98 cents each – not a bad price but much too high when you’re looking at buying 200 of them. (I wasn’t prepared to spend $200 on this acquisition). Turning to the Internet, I learned that 50 cents a puck is about the best price you can get. 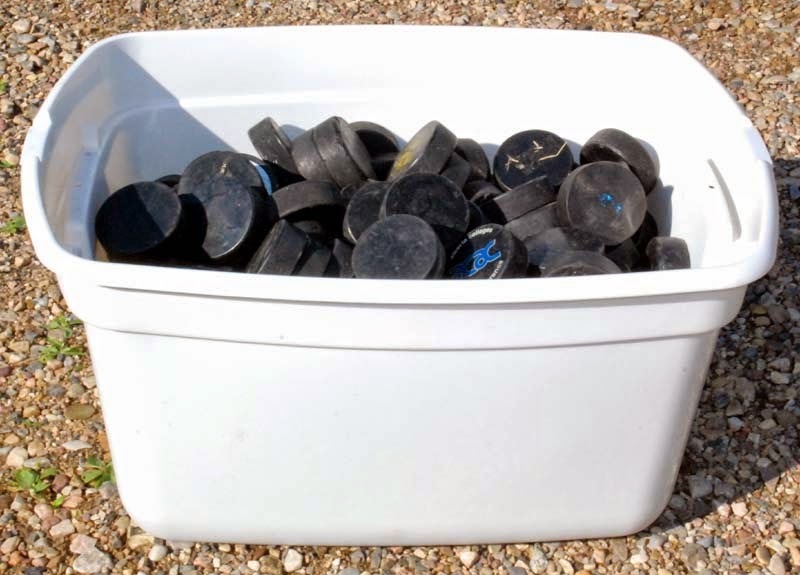 On Kijiji I found a guy in my area offering 200 pucks for $100 – right in my wheelhouse. We agreed on the price via email and I awaited a response about a meeting time and place. Meanwhile, I got a text response from another seller I’d contacted. 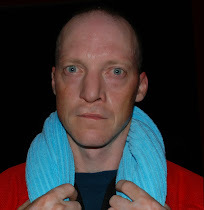 It was a fellow acting as an agent for his eight-year-old kid, who collects pucks around outdoor rinks each spring. I told him I’d already settled on a deal. Then seller No. 1 emailed back with meeting instructions. “I usually meet my buyers in the Co-op parking lot. Look for a black Honda,” he told me. Whoa. This guy regularly makes deals in parking lots? And he drives a black Honda? I realized that I was about to do business with a deadly Asian triad that specializes in stolen hockey gear! I could see exactly how it would play out. We’d be conducting our business and would start up an innocent discussion about a random beer-league topic – the relative merits of dumping and chasing, perhaps. But he’d be pro and I’d be con, and with the suddenness of a Kansas tornado, our disagreement would turn violent. In the end, the evening news would relate how my lifeless body was found stuffed in a Co-op shopping cart with a wad of hockey tape jammed in my mouth and a jagged chunk of composite stick protruding from my neck. I texted the kid’s dad and asked if he’d sell 200 pucks for $85. The kid went for it so I gingerly backed out of the deal with the triad guy. So I’m happy to report that I now have 200 pucks in my garage. I haven’t shot any of them yet because I need some more stuff to complete my shooting gallery, which is in the works. For those of you who are curious, 200 pucks weigh in at about 70 pounds and nearly fill a large plastic storage container, displacing about 1.6 cubic feet, or 45.3 litres, of volume.